Night Markets in Taiwan are more than mere shopping centers. These markets form part of their history and culture. These markets transcend time as they adapt to the new trends while they ensure to keep the Taiwan’s heritage and identity alive. Night Markets date back to an early Chinese dynasty period. In Taiwan, night markets were first set up as small community gatherings in street corners or temple plazas in urban areas. After some time, they then sprawled on rural areas to the point that remote areas have been reached by various products available in urban markets like garments, accessories, and food. From a small community gathering which meant serving banquet dishes, Taiwan Night Markets transitioned into serving simpler food. These simpler delicacies are still the trend we can usually see in Taiwan Night Markets. See also List of Must Eat in Taiwan. 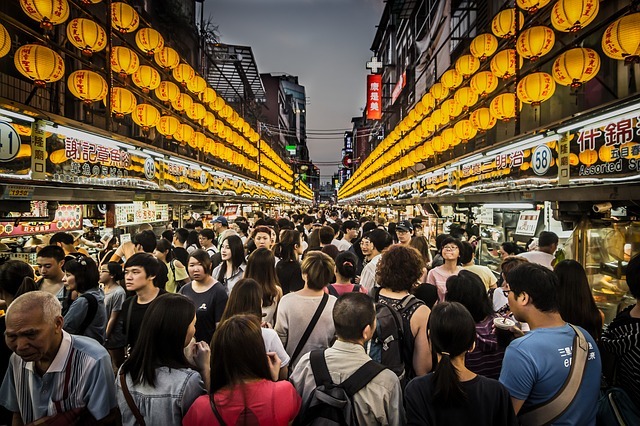 Night Markets in Taiwan surpassed the 1970s global recession and, even until today, are not anywhere behind the competition with world’s popular food chain or convenience store. Vendors in Night Markets adapt to the new trends while retaining Taiwan’s heritage and identity. So, in this list, I’d like to share with you the best night markets in Taiwan. The best food experience we had in Taiwan was in Aquatic Addiction Development. The seafood dishes are expensive but worth the price. With the scenes of the live seafood on tanks to beautifully plated meals and packed meals, Aquatic Addiction Development is a good story to add on Instagram. See also Instagrammable Taiwan. Aquatic Addiction Development is the old Taipei market, which features ten main seafood sections that mostly open early in the morning and close late by midnight. The improved Taipei Market houses a really nice supermarket where you can easily move around and shop for imported and local products such as seafood, meat, vegetables, and fruits. A separate fruit section can be found in the middle of flora section and merchandise section Segue in the Merchandise section to find home products and into flora section to order flowers and plants for home and office decorations. By the entrance of Aquatic Addiction Development are properly aerated aquarium tanks with live seafood like king crabs, lobsters, clams and scallops. These are sold to business consumers or individuals. Have them cooked in the cooking service section. Steamed or fried seafood or you name it and they’ll have the fresh seafood served on the plate. This cooking service section can also be referred to as the cooked food section since they offer ready-made seafood dishes. Indications that the night market has a long history are that they are located near temple plazas and they use attention-grabbing lights. Before you enter the east gate of Raohe Street Night Market by 4 PM until midnight, you’ll notice the Ciyou Temple on the right and the night market’s colorful welcome arch. Most people go here for a steaming hot pepper pork bun which you can buy from a modest stall right by the east entrance. Get in line before they run out of stock as they often do even before the midnight strikes. 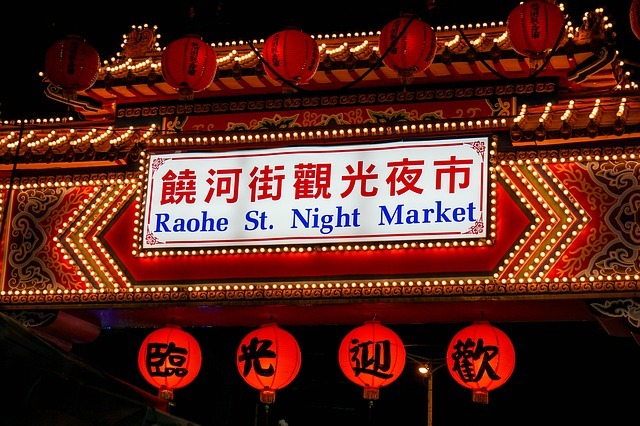 Read also the article Must Eat in Raohe Street Night Market. The Raohe Street Night Market has a narrow pathway. Stalls take up the middle space of the street. But, it has a good location since it is only within a business district of Taipei and it is near Songshan MRT Station. And, this is narrow but long street night market has a limited selection of food. The long stretch of the numerous stalls offers similar staple food, but feature most of the products and street food that best represent Taiwan. For this reason, many recommend this, especially for those who will be staying for a few days in Taiwan. Considered to be the largest night market in Taiwan, Shilin Night Market is decked on the District of Shilin, known for historical sites and for serving as a base of a huge population of expats coming from different parts of the world. The night market has triangle-shaped area bordering by the streets Jihe Road, Danan Road and Weelin Road. The night market is also near the Jian Tan MRT Station. It is open from 3 PM and most of the stores close past midnight. Located on the right of Jihe Road, the open-air complex of Shilin Night Market has been renovated and now a home to over 500 food stalls. Some of the food stalls are found on the underground level of the open air complex of Shilin Night Market. More food stalls joined by different merchandise stores are sitting within the triangle-shaped area of Shilin Night Market. Shilin Night Market can be overwhelming and too touristy. But, what people love about this night market is that it features many choices of clothing, accessories, home products, and food. There are also different selections of cuisines from local Taiwanese, Chinese to other international cuisines like American, European and Japanese. Shilin Night Market is also near heritage sites like Chiang Kai-shek Presidential Residence National Revolutionary Martyrs’ Shrine YuanShan Park. 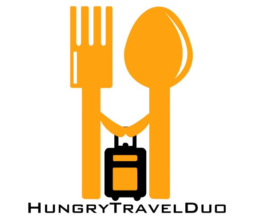 To get a private charter going around Pingxi District that includes Shilin Night Market or Raohe Street Night Market in the itinerary, you may book via kkday through this link. The popular night market sitting in the city next to New Taipei is the Keelung Night Market. Sometimes it is called Keelung Miaokou Night Market wherein Miaokou can be translated in English as Temple or Temple entrance. Actually, Danji Temple is located by the road which leads to the night market. 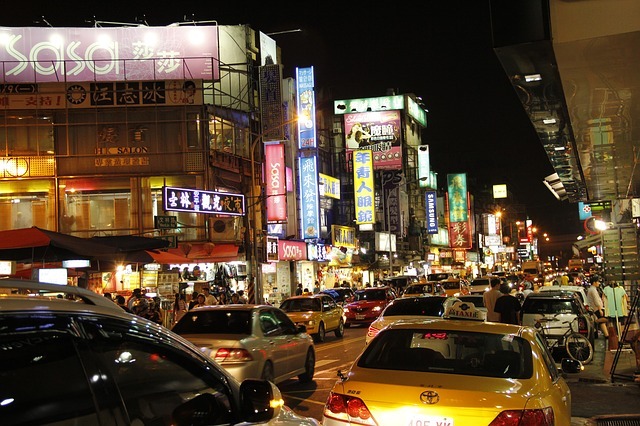 Keelung Night Market is considered as one of the smallest night markets in Taiwan. But, it is really rich in seafood delights, which are sold at cheap prices because Keelung has one of the busiest ports in Taiwan. It is a good place to drop by after visiting Jiufen which is located near Keelung City. Read also What to do in Jiufen. Just around 15 minutes away by a car going south from Shilin Night Market is a smaller but one of the oldest night markets. As you look at the signages, many food stalls and restaurants in Ningxia Night Market have been around the street for more than 70 years now. Another fun fact about the Ningxia Night Market is that they use grease traps in order to avoid clogging in their sewage systems. Another thing is that they promote the use of eco-friendly chopsticks. The Ningxia Night Market covers only a small stretch area and there is not really much to see. But, allows you to focus on their authentic local food. It also has a convenient location in the center of Taipei City. Other night markets you can try out are Tainan Flowers Night Market in the Southwest of Taiwan, which only has a schedule of two or three days every week but has a wide array of selection similar to Shilin Night Market and Feng Chia Night Market in West Taiwan, which is best known for having exotic but great local delicacies. Then, in East Taiwan, you can check out the Dongdamen Night Market, which is now the combined Zhiqiang Night Market and Futing Night Market. See also What Else to See in Hualien.